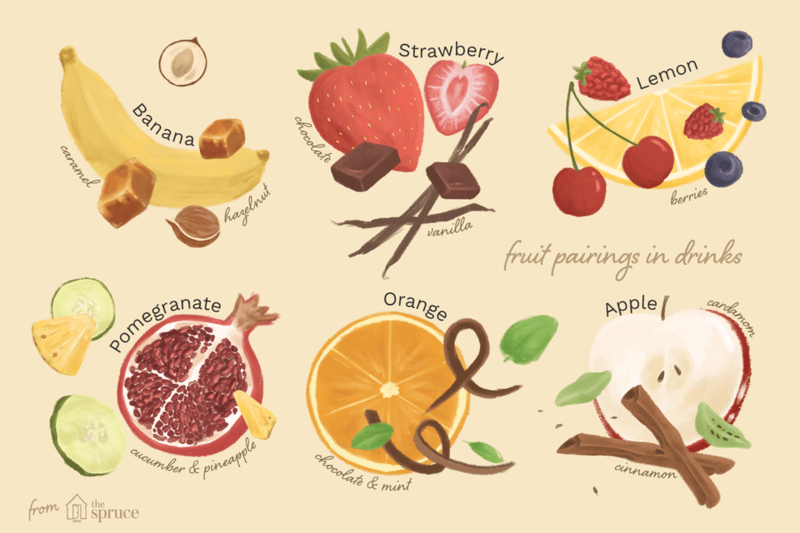 Many fruits have natural flavor companions: apple and cinnamon, strawberry and banana, cherry and vanilla. These are well-known pairings that are used all the time in food and drinks. But there's more out there and discovering new flavor combinations is half the fun of mixing drinks. Whether you're a cocktail connoisseur, a professional bartender, or a budding drink mixer, this study of flavor pairings is a valuable resource. It offers inspiration and should help spark ideas when you're looking for that key ingredient to perfect your new drink recipe. The foundation of these pairings comes from Humberto Marques, mixologist and owner of Curfew in Copenhagen in Copenhagen, Denmark. Not only has Marques been delighting drinkers with genuine flavor experiences and intriguing cocktails like his eucalyptus martini in bars like his own, but he has also spent years investigating the finer points of flavor. Certain fruit flavors work better with others and many of these recommendations are surprising. For instance, did you think that pomegranate and cucumber could be mixed into a single drink? Has the combination of banana and hazelnut crossed your mind? In his study, Marques has gone beyond common fruits like apple, orange, and berries. He also shares his thoughts on more exotic fruits like feijoa, persimmon, and tomatillo. These are especially challenging ingredients, especially if you have little experience with them. The cocktail world is filled with experimentation and flavors play off one another in very unusual ways. There are countless ingredients to choose from and that leads to even more possibilities as they are used in combination. If you're curious about where to begin with a new fruit or how to liven up one that's very familiar, these pairings can guide you in the right direction. This guide is not limited to cocktails and mixed drinks. It can also be used with food recipes and when pairing food with drinks. Some of the pairing suggestions have been supplemented with recommendations from "The Flavor Bible," written by Karen Page and Andrew Dornenburg. It is a fantastic resource with endless pairings for all sorts of ingredients you might use in your culinary escapades. Apples, berries, citrus fruits, and other common fruits make an appearance in drinks all the time. While you may think you know what to expect, there's often a surprise waiting when you begin to explore beyond the most obvious pairings. Apple pairs well with almond, apricot, caramel, cardamom, chestnut, cinnamon, citrus, cranberry, currant, ginger, hazelnut, lychee, mango, maple, orange, rosemary, and walnut. It mixes particularly well with brandy, kirsch, Madeira, rum, and vermouth. There are many great apple cocktails to offer inspiration. Apricot pairs well with almond, anise, apple, black pepper, caramel, cardamom, cinnamon, coconut, cranberry, ginger, hazelnut, honey, lemon, nutmeg, orange, peach, pineapple, plum, rosemary, Sauternes, strawberry, and vanilla. It mixes especially well with amaretto, brandy, kirsch, orange liqueur, and sweet white wines. For inspiration, explore tasty apricot cocktails. Banana pairs well with blueberry, caramel, cherry, chocolate, cinnamon, coconut coffee, ginger, guava, hazelnut, honey, lemon, lime, mango, molasses, orange, papaya, pineapple, vanilla, and walnuts. It mixes best with brandy, calvados, Madeira wine, and rum. Though it's not the most common fruit in mixed drinks, there are a few banana cocktails that can spark new ideas. Blackberry pairs well with almond, apple, apricot, black pepper, blueberry, cinnamon, citrus, clove, ginger, hazelnut, lemon, mango, mint, peach, plum, orange, raspberry, strawberry, and vanilla. It mixes very well with berry liqueurs, brandy, Champagne, orange liqueurs, Port wine, and red wines like Merlot. You can also explore the flavor combinations in a few blackberry drink recipes. Blueberry pairs well with other berries, cardamom, cinnamon, citrus, fig, ginger, hazelnut, honey, lavender, lemon, lemon verbena, mango, mint, nutmeg, peach, vanilla, and watermelon. Accent blueberries with berry and orange liqueurs. It's a fun flavor to mix with and blueberry cocktails are quite diverse. Cherry pairs well with almond, apricot, black pepper, caramel, chocolate, cinnamon, citrus (especially lemon), nectarine, peach, plum, sage, and vanilla. It will do especially well in drinks with amaretto, bourbon, brandy, crème de cassis, Grand Marnier, kirsch, rum, sweet vermouth, and vodka. Also, try mixing maraschino liqueur or Cherry Heering with a variety of wines, particularly dry reds, port, and sparkling wines. Coconut pairs well with almond, banana, basil, Brazil nut, caramel, chocolate, cilantro, citrus, cucumber, guava, honey, Kaffir leaf, lemongrass, lime, lychee, mango, mint, passion fruit, pineapple, other tropical fruits, and vanilla. As evident with the popular coconut rum and piña colada, it works especially well in rum cocktails. Try it in green tea drinks as well, and explore coconut cocktails for more ideas. Grape pairs well with almond, apple, chocolate, citrus (especially lemon), ginger, hazelnut, mint, pear, pecan, raisin, raspberry, rosemary, strawberry, and walnut. The flavor is an obvious companion for brandy and wines of all varietals, though grape cocktails also do well with a rum base. Grapefruit pairs well with banana, basil, black pepper, caramel, coconut, ginger, lemon, lime, melon, mint, papaya, pineapple, pomegranate, raspberry, rosemary, strawberry, thyme, tropical fruits, and vanilla. Surprisingly versatile, you will be pleased with grapefruit cocktails that feature Campari, gin, Grand Marnier, grenadine, rum, sparkling and white wines, tequila, and vodka. Lemon is used all the time as an accent in drinks, but even this fruit has some ideal flavor pairings. It works especially well with almond, apricot, basil, berries, black pepper, cardamom, cherry, citrus, coconut, hazelnut, ginger, mint, nectarine, peach, plum, prickly pear, rosemary, thyme, tropical fruit, and vanilla. For spirits, it mixes best with rum, vodka, and nut and orange liqueurs. It's also nice with sweet wines like Moscato. Lime is another staple accent for beverages, though it also has a few particularly wonderful pairings. Try mixing it with apple, berries, cherry, ginger, papaya, plum, strawberry, and tropical fruit. Melon pairs well with basil, blackberry, blueberry, cilantro, citrus, cucumber, ginger, lemongrass, lemon verbena, mint, strawberry, and vanilla. It mixes especially well with Champagne, Cointreau, curaçao, port, sake, sweet white wines, and tequila. The melon cocktail recipes available are surprisingly diverse and always refreshing. Orange is the third citrus fruit that countless mixed drinks rely on. You'll find that it pairs exceptionally well with almond, anise, banana, basil, berries, cherry, chocolate, cilantro, cinnamon, clove, coffee, cranberry, fig, ginger, grape, grapefruit, hazelnut, lemon, mint, nutmeg, persimmon, pineapple, pomegranate, rosemary, vanilla, and walnut. The fruit mixes well with most distilled spirits as seen in the many orange juice cocktails. It is particularly nice with amaretto, brandy, grenadine, tequila, and vodka. Pear pairs well with almond, apple, caramel, chestnut, chocolate, cinnamon, citrus, clove, ginger, hazelnut, nutmeg, pecan, raspberry, rosemary, vanilla, and walnut. It mixes best with brandy, port, crème de cassis, Grand Marnier, kirsch, rum, whiskey, and red, dry white, and sparkling wines. You will find many pear cocktails that employ these pairings. Pineapple pairs well with banana, basil, caramel, chile pepper, cilantro, cinnamon, coconut, ginger, lime, macadamia, mango, orange, pepper, raspberry, rosemary, strawberry, tamarind, and other tropical fruits. There are a variety of pineapple cocktails and it tends to work best with brandy, orange liqueurs, and rum. Pomegranate pairs well with apple, cardamom, cinnamon, citrus, cucumber, ginger, mint, and tropical fruit. For pomegranate cocktails, you'll find it works exceptionally well with port, tequila, vodka, and both red and white wines. Raspberry pairs well with other berries, almond, apricot, chocolate, cinnamon, citrus, ginger, hazelnut, mint, nectarine, peach, plum, rhubarb, thyme, and vanilla. You will find many raspberry cocktails with brandy, Champagne, orange liqueurs, rum (especially dark), tequila, and sweeter red wines. Strawberry pairs well with other berries, almond, apple, banana, chocolate, citrus, coriander, honey, melon, mint, peach, pineapple, rhubarb, vanilla, and walnut. It mixes best with brandy, Champagne, Chartreuse, elderflower liqueur, rum, sake, and red, rosé, and sweet white wine, though strawberry cocktails are very diverse. Less common in mixed drinks, it can be difficult to know where to begin if you come across fruits like mango, papaya, and rhubarb. They may catch your eye at the market, but how do you add them to a cocktail? You will quickly find that this is an invaluable guide to mixing the more exotic and less-used fruits into your drinks. Asian pear pairs well with almond, apple, black pepper, cinnamon, ginger, honey, macadamia, nutmeg, raisin, and vanilla. Blood orange pairs well with almond, cardamom, chocolate, cinnamon, clove, fig, ginger, honey, and other citrus fruits. Currants (black and red) pairs well with chocolate and citrus. It is excellent to mix with dark rum, port, sloe gin, and any style of wine, as seen when crème de cassis makes an appearance in the kir cocktail, bishop cocktail, and vermouth cassis. Elderberry pairs well with apricot, fig, honey, lemon, mandarin, other berries, peach, and plum. Feijoa pairs well with banana, berries, cinnamon, citrus, mango, and vanilla. Fig pairs well with almond, black pepper, cinnamon, citrus, hazelnut, pear, and vanilla. It mixes well with whiskey, port, and sparkling wine. Gooseberry pairs well with citrus, hazelnut, honey, other berries, and white chocolate. Guava pairs well with citrus, coconut, huckleberry, kaffir leaf, pineapple, strawberry, and tropical fruit. Kiwi pairs well with apple, banana, berries, cherry, citrus, coconut, mango, and tropical fruit. One of its most popular cocktails is the simple kiwi martini. Kumquat pairs well with berries, cherry, chocolate, cinnamon, coffee, persimmon, and plum. Lychee pairs well with citrus, ginger, gooseberry, tropical fruit, and vanilla. It mixes especially well with sake, tequila, and vodka to make some stunning lychee cocktails. Mandarin pairs well with cardamom, cherry, chocolate, cinnamon, coffee, fig, ginger, nutmeg, tropical fruits, vanilla, and star anise. Mango pairs well with apple, banana, berries, caramel, citrus, coconut, melon, Sauternes, tropical fruits, and vanilla. There are many great mango cocktails that offer inspiration for this fruit. Papaya pairs well with citrus, black pepper, lime, mango, and tropical fruit. Try it in cocktails featuring rum and tequila. Persimmon pairs well with apple, black pepper, cinnamon, citrus, kumquat, and pear. Plum pairs well with almond, cinnamon, citrus, chestnut, black pepper, hazelnut, honey, port, and vanilla. Prickly pear pairs well with citrus, lime, tomatillo, and tropical fruit. Rhubarb pairs well with apple, apricot, berries, black pepper, citrus, ginger, nectarine, peach, plum, and (especially) strawberry. It is not the easiest fruit to add to drinks, but there are tricks to adding rhubarb to cocktails. Tomatillo pairs well with berries, citrus, mango, prickly pear, and tropical fruit. Quite often, your pairing search begins not with fruit, but with a nut and that often comes in the form of a liqueur, syrup, or other sweeteners. To reverse roles, Marques has developed a few suggestions for those nutty flavors and some of these create fascinating tastes. Almond pairs well with apple, apricot, banana, caramel, cherry, coffee, fig, honey, orange, peach, pear, and plum. Keep this in mind when adding amaretto liqueur or orgeat syrup to your cocktails. Chestnut pairs well with apple, caramel, chocolate, coffee, pear, and vanilla. Hazelnut pairs well with apple, apricot, banana, berries, caramel, cherry, chocolate, citrus, fig, mandarin, peach, pear, and plum. The flavor is most often added in the form of Frangelico and other hazelnut liqueurs. Walnut pairs well with apple, apricot, banana, caramel, chocolate, cinnamon, nectarine, peach, pear, plum, and rum. Though not common, nocino is a walnut-flavored liqueur. Walnut pairs well with apple, apricot, banana, caramel, chocolate, cinnamon, nectarine, peach, pear, plum, and rum.